Yesterday was the first day of the North American Jewish Day School Conference, held at the Hyatt Regency hotel, just over the Virginia border, south of Washington, DC. I have a vendor booth, promoting my Virtual Tours of Israel. I have a terrific location at the fair, just inside the entrance, opposite the food station (!). The response has been very good so far, as those who have stopped by have been very interested in my idea, and open to my teaching a complimentary lesson to their schools. Now I need to follow up with them, impress them, and sign them up for sessions. 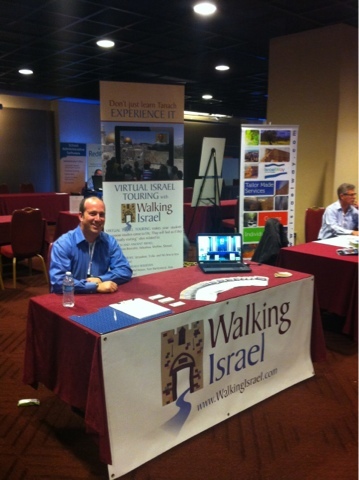 I have also been able to make a connection with some Israel touring companies, including IsraelWay, and the Israel Experience. I am confident this trip, with all of its accompanying investments of time and money, will be more than worth it. Thank you, Shanie Cooper, and the Virtual Paintbrush, for making incredibly professional and eye-catching promotional materials!